They’re not saying that they’ve been everywhere or done everything, but Lo-pan can tell you it’s a pretty amazing planet we live on here, and a band would have to be some kind of fools to think we’re alone in THIS universe. A borrowed view of the world perhaps but Jack Burton doesn’t seem to mind and it eloquently explains the state of mind these rock and roll mad scientists come at the world from. Born out of a combination of dirty rock and roll, stale beer and an unhealthy obsession with “Big Trouble In Little China,” Columbus’s Lo-Pan have been tearing up the club circuit since 2005. 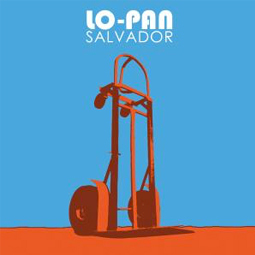 Lo-Pan burst onto the local scene with their locally released self-titled album back in 2006. The local buzz gave way to more national attention as bands told bands and Lo-Pan began gracing venues big and small with names like Red Giant, Devil To Pay, Torche, the Sword, Saviours, Year Long Disaster, Red Fang, Valkyrie, & the Atomic Bitchwax (just to name a few). Fast forward five years and there’s hardly a band worth playing with that they haven’t shared a stage with. Enter the sophomore release, “Sasquanaut.” Initial pressings on local indie Nice Life Records sold out quickly and as before the best praise is when one band on the road tells another “Hey, man you’ve got to check this out.” Which brought them, album masters in hand to us here at Small Stone. Enter Sasquanaut, mark 2: “Sasquanaut (Remixed & Re-mastered).” Heavier, more dynamic, louder and just that tiny bit more polished. Not ones to sit on their hands when there was rock and roll to make, Lo-pan handed over the masters and headed right back into to the studio to see if they could rock just a little bit harder. “Salvador” is the result of yet another frenetic battle between these humble Columbus rock and rollers and their inner demons. Eleven tracks of white hot rock and roll fury played like the boys were fighting for their immortal souls. The thunderous low ends and pummeling drums continue to beat your ears into submission. And battling it out front and center is the eternal dual between killer riffs and those soaring vocals. Look for the album late spring on both CD and 180 gram virgin vinyl and look for the band on the road pretty much all the time. After all, the porkchop express is never really off the road. And as always remember; IT’S ALL IN THE REFLEXES! Produced, Recorded, and Mixed by: Benny Grotto @ Mad Oak Studios – Allston, MA. Mastered by: Chris Goosman Basline Audio Labs – Ann Arbor, MI. Illustration & album artwork by Alexander von Wieding.